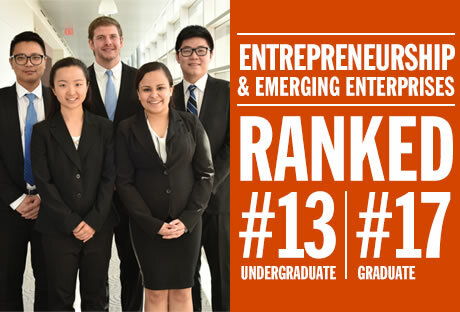 The Martin J. Whitman School of Management’s undergraduate and graduate entrepreneurship programs were ranked #13 and #17, respectively, by Princeton Review/Entrepreneurship Magazine in its annual rankings, which were based on a survey that included topics such as the percentage of faculty, students and alumni actively and successfully involved in entrepreneurial endeavors; the number and reach of mentorship programs, scholarships and grants for entrepreneurial studies; and the level of support for school-sponsored business plan competitions. The EEE program, which teaches approximately 2,500 students per year at the undergraduate, masters and doctoral levels, heavily emphasizes experiential learning in teaching entrepreneurship and is committed to providing a myriad of opportunities for students, many of whom are veterans, to gain and apply real-world perspective and skills. Aimed at developing the entrepreneur within, the Falcone Center for Entrepreneurship serves as the cornerstone of Whitman’s top-ranked Entrepreneurship and Emerging Enterprises program, helping to facilitate entrepreneurial activity on campus, as well as across local and regional communities. The Couri Hatchery business incubator within the center houses more than 130 student businesses. Hatchery occupants have collectively raised more than $3.4 million in external capital. Many Hatchery alumni have gone on to become successful business owners. The Falcone Center, which this year received the NASDAQ Center of Entrepreneurial Excellence award, provides valuable entrepreneurial resources, such as new venture business planning, through a variety of initiatives and program including the WISE (Women Igniting the Spirit of Entrepreneurship) Business Center, the South Side Innovation Center and veteran’s entrepreneurship training, such as the Barnes Family Entrepreneurship Bootcamp for Veterans with Disabilities (EBV) program. For more information about Whitman’s entrepreneurship programs, visit whitman.syr.edu/eee.